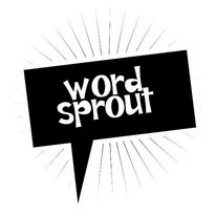 This month I will be republishing the three guest posts I wrote for Word Sprout’s 2014 blog residency. These included an introductory post (“How I Got Here/Why I Do This”), a “Tricks of the Trade” post, and a “Check This Out!” post. You can sample the How I Got Here/ posts from all the residents to date here. Below, with slight modifications, and a few extra illustrations, is the text of mine. When the kids were four and six, we moved to Tennessee so my husband could get his Ph.D. in theology. He wanted to teach in a seminary. I took my technical writing job with me; personal computers were just beginning to make this possible. I was experimenting with my own writing at the time – children’s books first, then fantasy and science fiction. There were monthly family letters to two sets of long-distance grandparents and a growing list of friends who asked to receive them. 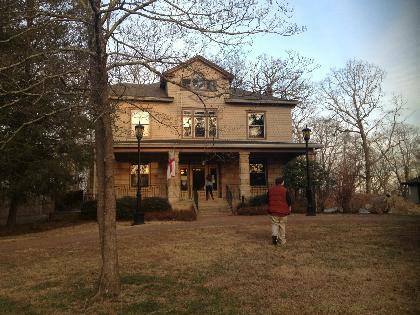 The Rectory at Sewanee – one of four homes we lived in in Tennessee. Now graduate students live there. Photo courtesy of Phillip Clifton. And finally, there was a column, Ordinary Time, for our church newsletter. 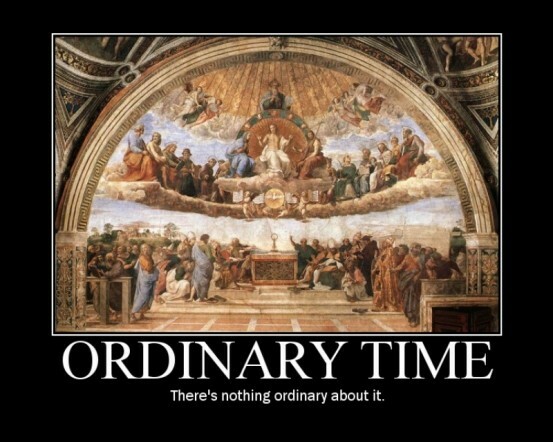 Ordinary Time is what churches that follow a liturgical calendar call the period after Pentecost and before Advent. Most people think it means “ordinary” in the sense of “mundane,” or “common,” but the term actually means “counted” time, because the Sundays after Pentecost are counted. So it’s ordinary like ordinal numbers. Sequential. Orderly. Spoiler alert: I am no longer writing columns for a church newsletter. And a lot of things in my life are no longer orderly. But it was in those letters and in that column that I first began to find my voice. One year a friend of mine from Minnesota with whom I had recently reconnected (on AOL, people, back when the Internet ran off of opaque projectors) asked me if I lived anywhere near Jonesborough, Tennessee and was I going to the National Storytelling Festival. I had heard about the National Storytelling Festival from my former neighbor, a librarian in the Nashville Public Schools. Every year in October thousands of people descend upon this tiny little town, and they set up tents just like an old time revival meeting, and people get up on stage and told stories, beautiful stories, all kinds of stories – personal stories, folk tales, myths, historical stories, ghost stories – all sorts of stories from all different cultures. And you just went to listen and have a good time. 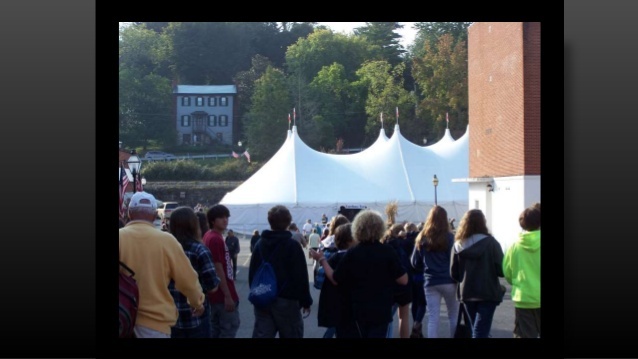 One of the tents at the National Storytelling Festival. Photo courtesy of Carolyn Stearns, who has a whole slide show here. This festival was on a weekend, and my husband worked weekends. Any time he had off we generally spent in family travel to those long-distance grandparents, or to the Upper Peninsula of Michigan, where he had a summer gig, and we got a free cottage. But here was an old friend, who had once been much more than a friend, asking if he would see me there. It was 1998. I was forty-two. For the first time in a long time it occurred to me that I might go somewhere alone. I came back from that weekend wanting more. There were parts of myself that had gone missing, and I began to find them, and gather those pieces together again, through storytelling. 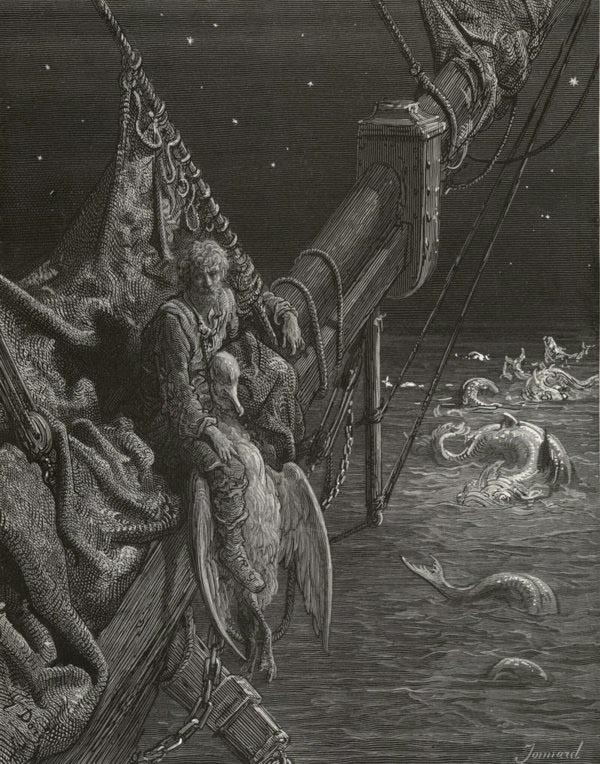 I’ve told a number of stories of varying lengths and complexity around this fact.No doubt I will keep telling them, like the Ancient Mariner, till I bless something unawares and the albatross drops from my neck. You can read the version I told at the Twin Cities Moth slam in 2013 here. Why I write and tell stories has changed over the years. But the core reason has always been that writing – memoir writing in particular- is a form of insight meditation for me. I learn things about the meaning of my own experiences, and make connections to the experiences of others that I hope will make me a more empathetic and compassionate human being. When my writing and storytelling resonates with an audience, it confirms that insight. When it does not – when the story line is hiding a reality I do not want to face or admit to – a good audience picks up on the hollow, the strident, the caricature, the simplistic moral, the too-neat ending. Not always, but often enough. In 2013 my mother was diagnosed with Alzheimer’s, like her mother before her. It’s been a difficult journey, and I don’t expect it will get much easier. But it has made me think deeply about the privilege of having a Self: a consciousness, a personality, an intelligence shaped by experience – and how fragile and ephemeral that Self actually is. It has given me a new awareness around what it means to make my experiences accessible to others – particularly those I love and care for, and who love and care for me – when they are no longer accessible to me, or I am no longer able to articulate them. Lovely post, Paula. I like how you started with telling stories both to reveal and conceal, and ended with celebrating your conscious Self. For me, each of those remain valuable motivations for stories. Thanks, Anne. I think it’s important to recognize that it’s not always just one or the other, but both. The storytelling festival sounds amazing and it’s great you were able to go. I should look into seeing if there’s any near where I live. I really enjoyed reading what writing has meant to you & what it continues to bring to your life. I imagine the fear of getting Alzheimer’s adds to your motivation to write but I certainly hope it turns out to be an unfounded one. Hi Paula. Your post is mesmerizing. You certainly are an accessible writer and I’m pleased you found your way to writing memoir. I love your description of Ordinary Time and the Storytelling festival. Keep writing! Thank you Victoria. Sorry it took me so long to respond – it’s been a hectic week. Being both mesmerizing and accessible at the same time is not something I accomplish often or easily, so I am grateful when someone makes such an observation. As for guest posting, I do not use Twitter DM very often, but if you’d like to proovide some details about what you might be looking for and by when, my email is on my About page. As Mr. Spock once famously said (and Dr. Spock should have), it seemed like a good idea at the time. Thanks, Jann, for stopping by. What a great post. You’re certainly a great storyteller and it’s fascinating to find out how you discovered that for yourself. Thank you Tru. You’re a brave soul and I look forward to learning more of your story. I like hearing about your coping strategies.